Not all layouts have to include photos. Sometimes your journaling will be the most important element on your page. This may be because you do not have photos from a particular event or simply because you want to jot down some memories. Whatever the case, journaling pages can form an important part of your album. This layout shows how you can use stickers to dress-up your journaling page without taking the emphasis off your words. This layout was created for an 8 1/2 by 11 inch album, but the ideas can easily be adapted to any size. This layout was created with brown cardstock, blue cardstock, a corner punch, brown chalk, Hot Off The Press Tag letters, Pebbles Inc Masking Tape Travel Labels stickers and Pixie Press Travel stickers. 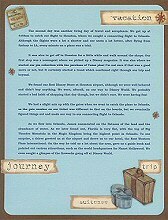 Begin by printing of writing your journaling on blue cardstock. I have printed my text from the computer with blue ink. Make sure you leave plenty of room at the top and bottom for embellishments. Make sure you also leave room at the sides so you can trim your paper to size. Use your corner punch to round each corner of both pages and then adhere to your background brown cardstock. Select the Pebbles Inc Masking Tape Travel Labels you stickers you wish to use on your page. Lightly chalk the edges with brown chalk. Ink will not work well in this instance as the stickers are not very absorbent. There is no need to seal the chalk - just wait 24 hours before placing your page inside a sleeve protector. Position your stickers around the page and adhere. 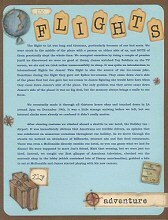 Select the Pixie Press Travel stickers you wish to use on your page and adhere in place. Note that I have used the small compass face stickers to enhance two of the Travel Labels stickers. I have also layered several stickers for added interest. Play around with what works best on your page while still maintaining balance across your two pages. Finally, use your tag letters to create your title. Simply cut them out and adhere in place.